I’ve never spent much time in Dublin. The feeling in Belfast among the people I knew there in the 1980s was that the south of Ireland was a very different place. Down there, no British troops patrolled their streets, no sharp metal walls severed their neighborhoods. No warring flags, no paramilitary parades, no plastic bullets. Like it or not, Dublin lay on the other side of a border. Besides, it wasn’t where the action was—the craic, as my Belfast friends called it. We didn’t go. And so it may be the case that Dublin was always jam-packed with protests and people strolling around on historical walking tours—but I doubt it. The Nation would like to thank the Pulitzer Center on Crisis Reporting for the generous grant that made this story possible. This year marks the centennial of a defining event in Irish history. The Easter Rising of 1916 inspired anti-imperialists the world over, from Gandhi to Lenin to W.E.B. Du Bois. Propelled by history, grinding poverty, a sense of grievance, and the whiff of possibility, on Easter Monday, April 24, some 1,500 Irish men and women took up pikes and clunky rifles and took on the war-worn British Army. The rebellion was joined by radicals and romantics; secular socialists and Catholic nationalists; suffragists, nurses, and millworkers; poets and a countess. Led by, among others, Patrick Pearse, James Connolly, (Countess) Constance Markievicz, and Dr. Kathleen Lynn, the rebels took over central Dublin and proclaimed an independent republic. “We declare the right of the people of Ireland to the ownership of Ireland and to the unfettered control of Irish destinies,” they declared. After centuries of discrimination, they pledged that in their republic, all citizens would be equal. It would “cherish all of the children of the nation” and “all of its parts.” That’s not what happened. After six days of urban warfare, the rebels surrendered and the British authorities responded by executing 16 of the leaders, including Connolly and Pearse. (The women’s lives were spared, to their chagrin.) The firing-squad executions (Connolly, already wounded, had to be propped up to be shot) and the British firebombing that flattened much of the city stoked enough anti-British sentiment to bring independence within reach—but it came only for part of Ireland, and at a price. A 1922 treaty drawn up in London split the state in two and created the north/south border. One century later, the Irish are in a propitious mood for a yearlong consideration of the Rising. Victims of one of the most spectacular bursts of speculation in the global financial crisis, Irish workers are looking for a viable alternative to casino capitalism and trickle-up neoliberalism. Irish voters just took a political pike to the parties of the Irish establishment. The bums are out, but it’s not clear who’s in. In Northern Ireland, what’s called the “Good Friday Generation” will vote for the first time in the next election. The 1998 Good Friday Agreement pulled most British troops out of the province, disarmed the paramilitaries, overhauled the police, and re-created a power-sharing regional government. This May, the first class of school graduates and job seekers born since the accord will be eligible to vote in elections for the Northern Ireland Assembly. They’ve grown up in relative peace, but in a decade of Tory cuts, and their patience is limited. Previous generations “grew up in the Troubles—I understand that,” said Ryan Denver, a young assistant butcher in West Belfast, speaking to me this past April. “I think differently, and a lot of young people think differently. For me, it’s all about the economy.” Denver said he’s voting for Gerry Carroll, an anti-austerity candidate of the People Before Profit Alliance party, who seems destined to win the party’s first Assembly seat right here in the hometown of nationalist Gerry Adams, the longtime president of Sinn Féin. 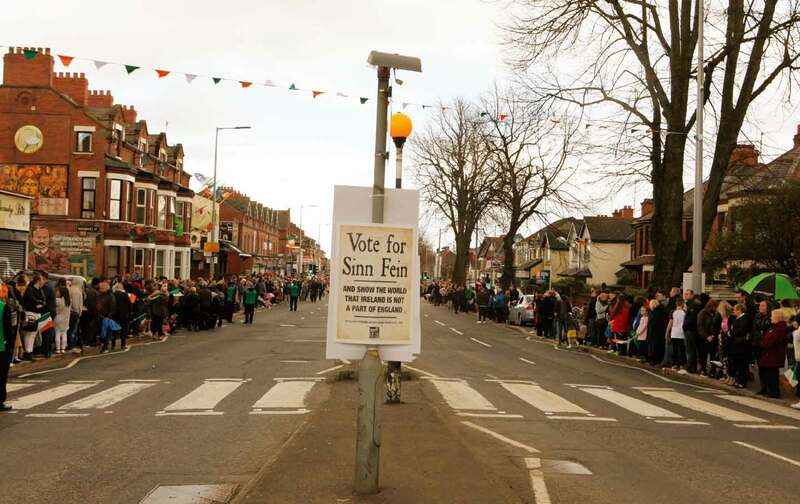 Carroll’s face appears on lampposts, his election posters above or below Sinn Féin’s, depending on who got to the lamppost first. The lamppost wars say it all: The crisis of the status quo has put a new premium on being antiestablishment, just as Sinn Féin, the Rising-era party of republican independence, is getting close enough to power to be tainted by it. The name Sinn Féin never used to appear without its subordinate clause, “the political wing of the IRA.” Antipartition and pro-kicking the Brits out, Adams was banned from radio and TV in the 1980s. Now he’s a Twitter addict and an elected member of the Dáil Éireann, the powerful lower house of the Irish legislature in Dublin. Sinn Féin is the largest party standing in opposition to the two major parties, Fianna Fáil and Fine Gaul, and its sights are set on winning the presidency. In the North, former IRA leader Martin McGuinness has served as deputy first minister since 2007. The party’s representation in the regional government has grown with every election. But power sharing has meant cooperating with some of the most reactionary politicians in the UK (the loyalist old guard) and signing off on cost cutting. This generation has grown up in relative peace, but during a decade of Tory cuts. This Easter, every schoolchild in Ireland, it seems, has been asked to write their own Proclamation. Every town appears to be discovering the unique part it played in the Rising, or making one up. When the American magazine Jacobin slapped James Connolly’s line “All Hail to the Mob” on the cover of its special issue on 1916, a real mob bought it. At the release party—which also served as a teach-in on the contemporary relevance of the revolutionary period—the publishers sold around four times as many copies as they anticipated, and the room at Liberty Hall was packed. O’Toole wrote a book on Ireland’s financial crash called Ship of Fools: How Stupidity and Corruption Sank the Celtic Tiger. He’s not alone in his belief that the routine of boom/bust/budget cuts has been a shameful way to behave as a nation. Since 2008, successive no-good governments have imposed $34 billion in tax increases and (even more) spending cuts, amounting to over 15 percent of GDP. Now, half of net household wealth sits in the hands of just 10 percent of the population, while almost one-third of all Irish children live in materially deprived households. Homelessness is rampant, and as of 2014 lenders had initiated legal proceedings to repossess 49,000 more homes by year’s end. In this context, it’s no wonder that Connolly’s writings on the “rack renting, slum-owning landlords” and the “profit-grinding capitalist” (not to mention the “prostitute pressmen”) resonate. On Easter Monday, I found Byron Jenkins, who volunteers with a self-help group for people in mortgage trouble, speeding along with a Stop Foreclosures banner in a Rising parade, squeezed between people dressed up as 1916 rebels. “Irish history is the history of people having their property taken. Then it was the British; today it’s by the banks,” he muttered, breathless. Jenkins was a little hard to hear over the jubilant crowd (also in period gear) chanting “Whose history? Our history! Whose streets? Our streets!” The Save Moore Street campaign has good reason to shout: This low, terraced block near the group’s headquarters in the general post office is where the rebels fled during the last days of the Rising. It’s also where small-market vendors have fled for refuge from the antiseptic malls and chain stores of modern Dublin. For years, much of Moore Street has been slated for commercial development (of yet another shopping center). This winter, campaign members moved in and occupied for almost a week. Some family members of the rebels also took the developers to court. On March 18, in a surprise ruling by a High Court judge, construction was stopped and the “battlefield” site declared a national monument. “People are off their knees, and they like it,” said independent TD Clare Daly the next day in her office, in a break between taking calls from newly electeds. (TDs, or Teachta Dálas, are members of the lower house of the Dáil.) “The last general election was one of the more interesting in Irish history,” she added, smiling at the understatement. Fianna Fáil and Fine Gael, the two traditional parties of Irish capitalism, have been in the habit of sucking up around 70 percent of the vote between them. This February, they won barely 50 percent. The Labour Party, their junior party in austerity crime, attracted less than 7 percent. The largely Trotskyist Anti-Austerity Alliance-People Before Profit coalition won six seats. Fed-up fury accounts for some of the upset, but 2016 also saw strategic organizing on the left. Daly’s one of more than 100 progressive, socialist, communist, and Sinn Féin candidates who joined an alliance of labor unions, community groups, and political parties advancing a very Proclamation-like platform: the right to water, jobs, decent work, housing, health-debt justice, education, democratic reform, and national ownership of national resources. The Right2change campaign grew out of Right2Water, the 2014 mass revolt against the Irish government’s attempt to introduce new water charges. “Hundreds of thousands of people took political action for the first time. It touched on way more than water—it was really about the way our society has been organized,” Daly said. Eoin O’Broin was one of those protesters. Born in Dublin in 1972 and politicized in London, where he went to college, O’Broin said he’s been a full-time activist for two decades. In 2001, he was elected to the Belfast City Council. He’s run for all manner of seats since then. This February, he topped the poll with a constituency in West Dublin that threw out three of its four incumbents and gave him a seat—his party’s first in the district. O’Broin’s a Sinn Féin leftist, a blend of old and new. He has nothing but respect for the leadership of Adams and McGuinness and the old guard, but unlike them, he hasn’t been imprisoned, accused of membership in a paramilitary organization, or denied a job on the basis of his religion or his address. The debates that animate him are over Connolly’s Marxism (he used to edit The Left Republican Review), and the parallels between Sinn Féin, Syriza, and Podemos. In a sign of how much has changed, I saw O’Broin twice in a matter of days, in two different cities, in countries that don’t feel so apart anymore. The second time we were in Clondalkin, a shopping-center town a 30-minute bus ride west of Dublin. The first time we were in West Belfast, at the bottom of the Falls Road, for the kickoff of Sinn Féin’s campaign for the Assembly. All of the party’s leaders were there, headed by Sinn Féin’s vice president, Mary Lou McDonald. McDonald has served as a member of the European Parliament. Today she serves in the Dáil (except when, at the height of the water crisis, she was suspended for firing questions about garnishment of unpaid water charges at an evasive minister). At a long, low table, Adams, McGuinness, and Sinn Féin’s five local candidates sat side by side. It took me a moment to register that all of the candidates are former prisoners. In 1916, Gen. John Maxwell executed a generation of Irish leaders. Those of succeeding generations were more likely to be incarcerated; now, they’re out and about. Jennifer McCann was 20 when she was arrested and charged in the killing of a policeman. Fra McCann (no relation) was interned at 17. Some people—and not only loyalists—fume over working with people they will always consider terrorists. But if you’re looking for republican principles, former prisoners have read not only the Proclamation (“For me, it’s a living document,” said Fra McCann) but also Pearse and Connolly. In prison, they got the education many of their generation missed. “You took part in history lectures. You started to learn the Irish language,” said McCann. They called it “freedom university.” In the 1970s, people like these were on the run. Today, they’re running for office. Bobby Sands did it 35 years ago, from Long Kesh prison while on hunger strike, and changed the course of Sinn Féin politics. The Assembly elections are taking place on the anniversary of his death, May 5. “It’s a very exciting time to be a republican,” exclaimed Adams. In Belfast, I was reminded why I came here in the long-ago first place. Growing up in London in the 1970s, I’d learned to fear the IRA but knew next to nothing about them. And then I heard about mothers and grandmothers who banged bin lids on the street to warn that troops were coming. I read about 30 Republican women in Armagh Prison who were living in their own feces and menstrual blood rather than accept the prison’s terms for “toilet privileges” and criminalization for what they believed were acts of resistance. Jennifer McCann was one of those women. I went to Belfast because I’d become curious. I arrived and learned new questions: not just about why British soldiers and tanks were on supposedly “British” streets, but about why young families were living in poisonous, overcrowded tower blocks; about why workers were forced to give up basic rights because jobs for “their sort” were so often denied. I watched the wife and small child of a man crouch by his side as he died, from a plastic bullet fired by a policeman who knew he could get away with killing just about anyone. And I saw a state that didn’t care but women, especially, who did, who worked every day in a system they hated to extract every last penny they could from it so that their people could eat and get a doctor’s appointment, or maybe a passport so they could go south for a wee holiday. Liz Groves—or Elizabeth, as her husband Danny calls her—works in Connolly House, a Sinn Féin advice center. Connolly’s face is on the building’s facade, as is a plaque to Sean Downes, the plastic-bullet victim. Downes died on the Andersontown Road, in the street between Connolly House and the low row of shops opposite. I was about the same age as Downes (22) when I saw him get killed at a republican rally in August 1984. I captured the shooting on Super-8 film, sheltered by the awning of the butcher’s where Ryan Denver now works. Back then (and again today), Groves spent her days “working the system” to the best of her ability, on behalf of anyone who walked through the door. It’s a fighting approach to battling austerity: “Get people their money.” The day I was there, she showed me page after page of a detailed ledger reporting that the Andytown office had secured £250,000 in benefits for its clients in the preceding six months. This isn’t just benevolent liberalism: Loyalty can make or break an armed struggle. The leaders of the Easter Rising made sure that cartloads of food were brought into their headquarters in the general post office. Likewise, Sinn Féin—which has asked its people to put up with a lot—has learned to look after them. These days, there’s no armed struggle, but there are still Tory budget cuts; and since the Good Friday Agreement, and in less discriminatory times, both communities feel the pinch. Workers at Sinn Féin’s centers say that roughly 25 percent of the people who come in for help with eviction notices, or because they’ve been denied benefit claims, are from the “other” side of town—the unionist, mostly Protestant community. “They find it amazing that if we can’t deal with their problem, then we go to [a city councilor] or an MLA [member of the Assembly] or even call our people in Dublin. They find things happen,” said Groves. She has one especially accessible City Council member: her daughter Emma, who was named after Danny’s mother, a legendary activist in this community who was blinded by British soldier’s bullet shot through her living-room window. “Does the Rising still have relevance?” I asked mother and daughter on Good Friday this year, right before we all headed down Falls Road to the unveiling of a brand-new, city-funded statue of Connolly. A founder of the Irish Citizen Army, he lived from 1910 to 1916 with his daughters on the Falls, working to organize Belfast’s millworkers. The Sinn Féin project is a work in progress. On Easter Sunday, while Criona Ní Dhálaigh, the first Sinn Féin mayor of Dublin, presided alongside lame-duck Taoiseach Enda Kenny over the official ceremonies, including a wreath-laying and a troop parade, Belfast saw its largest Easter parade ever. Braving rain and hail, the marchers came to a halt in Milltown Cemetery, near the Republican plot. Adams called the Proclamation a “freedom charter,” its defeat the work of “big business” and the church, and reconciliation with unionists to create a “society of equals” the unfinished work of the Easter Rising. In closing, an honor guard fired a volley of shots over IRA graves. It’s a 1916 reference, but Sinn Féin may have to cut that part if it really wants those unionist votes. The pageantry over, the clouds cleared and tens of thousands of families headed home, beneath ribbons of Easter bunting and the faces of Connolly, Carroll, and McCann looking down at them from the lampposts.